For example: an order was cancelled and you need to know if the charge was refunded or voided. Voided means the charge was cancelled before it went through to the bank, so the customer doesn’t have to wait the so many business days their financial institute requires before they get their money back. 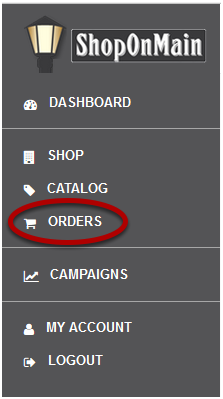 Orders is located in the menu on the left hand side of your account. If you have the customer’s name or email address, you can type it in there and click Go, or simply search using the order status. Every time you click on Orders, all the Pending orders will pop up as default. It is important to note here that in this tutorial we will be using an order that is currently in Cancelled status, but if you’re adding an item to an existing order, the order will likely be in a Pending status. It can also be on Hold or even In-Process, but once it’s in Shipped status, it’s likely too late to add to it. Select the ID of the order you need to edit. Click on the Txns tab to view the payment details for the order. At the very bottom of the Txns tab is the Txn History. Here you will find any amounts that might have been voided. If there is a dollar amount in this column, it was successfully voided.